Heavy metal and wrestling go together like peanut butter and jelly or, from wrestling lingo, like heels and baby faces. Think of the iconic brew of Triple H and Motorhead for the The Game. WWE professional wrestler Chris Jericho has developing his love for heavy metal since his first album in 2000. Now, 17 years forward Jericho and Fozzy return with their sixth album Judas. Now, because it's Chris Jericho, a WWE wrestling fan favorite, we're also supposed to love Chris Jericho as a metalhead and heavy metal vocalist. Maybe so. While you can hear the Fozzy affinity for classic heavy metal, there's definitely a certain predictability to their modern take on it. And that's likely the defining key to the Fozzy metal sound, modern. 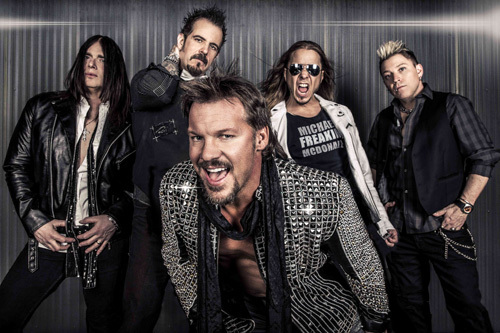 Essentially, Fozzy takes traditional melodic heavy metal and washes it through modern and post grunge down-tuned heaviness, this mostly coming from the thick riffage and heavy bottom end. Yet, Jericho and Fozzy don't fumble the necessities like harmony in the riffage and vocals, driving rock groove, inherent melody, and, usually, some decent guitar solos. Jericho sounds clean and clear, yet a tad muted in the mix, getting pummeled by the music. Additionally, there's some synth accents and baubles throughout. However, and as I alluded to earlier, all these things are rather expected, that is predictable and redundant to the Fozzy modern metal sound. Sure, I found songs like Judas, Drinkin With Jesus, and Weight Of The World rather interesting, catchy, and positive exceptions. Then there's Three Days In Jail which combines d-tuned modern metal with rapping vocals juxtaposed against harsher vocals. But that's nothing novel. In the end, I found Fozzy's Judas somewhat interesting and entertaining, yet in an ambivalent sort of way. In the end, I found Fozzy's Judas somewhat interesting and entertaining, yet in an ambivalent sort of way.